I have spoken about my love of Christmas movies many times on my blog. I can’t help it I love them. I love the feel good factor, the happy endings and the love of family at Christmas. They aren’t all fuzzy and sweet, don’t worry, there are ups and downs along the way to the happy ending! Plus there are some creepy and sad Christmas films if that floats your boat. For me Christmas films should be all sweetness and light. The Good Witch Movies are always a favourite with me at Christmas, with a new one coming out each year. What do you look for in a Christmas film? I always make sure I have the Sky Movie Channels at Christmas time, giving plenty of time to get caught up on all the up to date films and lots of Christmas classics thrown in. Sky Movies has the best range of Christmas films I’ve come across and has many up to date films and more than one screening so you won’t be missing out on a thing. Sky Movies Christmas isn’t just about their movies, no, they also have a fantastic Christmas card making section on their website. The Sky Movies Movie Me site has a section where you can put your photo on a gorgeous Christmas card starring alongside Disney’s Frozen, or Emmet and friends from the Lego Movie or even Spiderman himself from the Amazing Spiderman 2 or how about starring alongside the Muppets? These might just be my favourite, well I grew up with them after all and I’m looking forward to seeing their new film this Christmas, Muppets Most Wanted. These four fantastic films will be on over the Christmas period on Sky Movies and if you miss them, they’ll be on On-Demand so don’t worry. Head over to the Movie Me site. Select the movie you or your little ones would like to star with from the template options. Upload your photo or take one to add to the template. You can even chose one from Facebook if that helps. Once you have your chosen photo, click next. Add the name of the person in the photo, by typing it into the box. You can now preview the card. Once you are happy with it, press next. 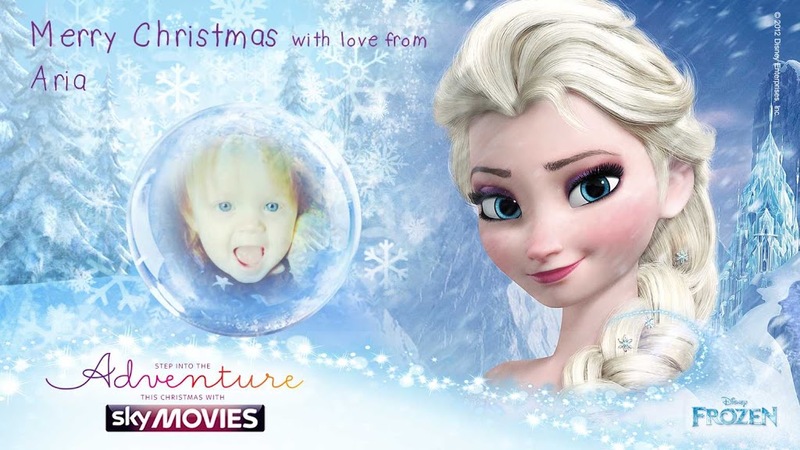 You can now share your Christmas card with @skymovies and the hashtag #movieme on twitter and Facebook. Or you can print the card, download the card, email the card and send the card to friends and family, by filling in your details. Simple as that and it looks great. Here is our first card, it took minutes to make and I think it looks excellent. I love this picture of Aria too. What do you think? I think this is a great idea from Sky, they are simple and easy to do. The kids can send them on to friends and family and have fun in the process. Tyler is wanting to create a Lego Movie one, so watch out on my twitter feed for more Sky Movies Christmas cards. Why not have a go yourself. I’d love to see your creations and know what you think? Why not have a look at the Sky Movies advert for this Christmas and feel all warm and fuzzy at all the great family Christmas films coming on soon. Disclaimer:- This post was done in collaboration with Sky, but all words and opinions are my own and I love these cards.